This to date is the most interesting drink that I have ever had. In my opinion bacon is the most versatile ingredient in the culinary world. I can not think of one dish that adding bacon to will not make it better. You eat it with breakfast, on salads, dipped in chocolate, on sandwiches, you can even wrap other meats in it! But bacon in a drink? When I heard about The Patterson house and their Bacon Old Fashioned I had to make a stop. Upon walking into the Patterson House, I got the feeling I was entering a secret club that only people who lived in Nashville knew about. The waiting area is lined with bookshelves ending with a velvet curtain that intensifies your curiosity as to what is on the other side. Upon entering through the curtain you discover a large room with book cases again lining the walls. There are several booths and an enormous large square bar in the center. The tin ceilings, warm lighting, and rich wood color of the bar sets an inviting mood. I was seated at the bar and new exactly what I wanted. The Elvis Panini and a Bacon Old fashioned. You will have to wait for another post to find out about the Elvis. Chauncey began making my old fashioned. She started with an ice sphere. Yes, no ice cubes here. 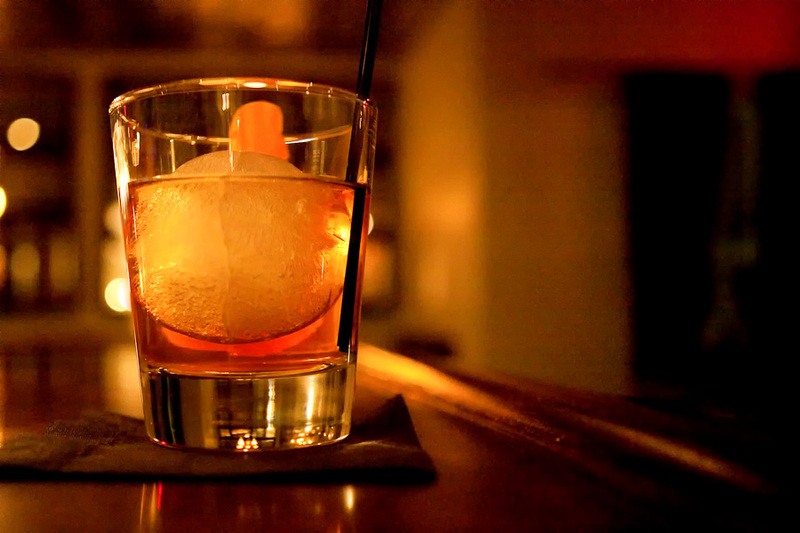 At Patterson House they use a copper mold to individually make ice spheres for their drinks. To that she added a combination of maple syrup, Bentons bacon infused 4 roses bourbon, and house made coffee pecan bitters. An orange slice rind was used as a garnish. Now the moment of truth and the first taste……………. I could not believe it! At the end of the drink was the distinct taste of bacon! I am a huge bacon fan and would know that taste anywhere and yes! It was bacon! If you do not believe me then you will have to try it for yourself! They infuse the bourbon with bacon on site using a fat wash method. Basically this in involves taking hot bacon fat, combining it with the bourbon, and freezing it so the fat and bourbon separate (fat has a different freezing temperature than alcohol so it works out). Later in the week I will continue my Patterson House experience with the Elvis Panini. I am curious, leave a comment if you think this drink sounds good? Mmm. Maybe. I agree that you can never go wrong with bacon. But I may draw the line at bacon dipped in chocolate or bacon flavored whiskey. LOVE the new blog! 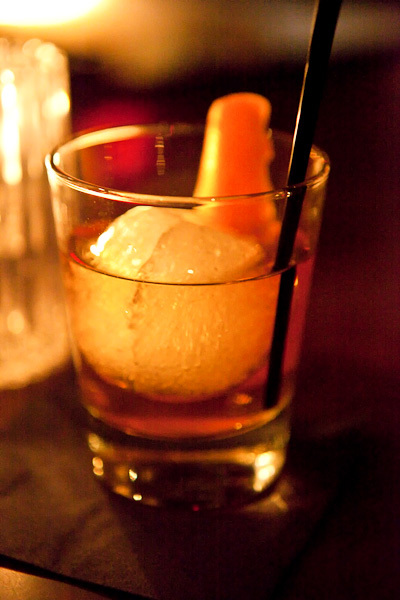 That drink, my friend, sounds like heaven on the rocks.Ingenious to combine two of my favorites: bourbon and bacon. Obviously, a trip to Nashville is in order. I will be dusting off the GPS and packing a bag. Looking forward to the Elvis Panini. Discovered you from Food Gawker and am immediately subscribing. Nice to meet you! Thanks Suzanne! It was a pretty amazing drink. The Elvis will be up later in the week. Thank you for subscribing, have a great day! And this is why living on the same street as Patterson House is very dangerous. The drinks are all awesome, but honestly… I’m easy to please with alcohol. What keeps me going back is the vibe and the staff (and the fact that I can stumble home safely afterwards). That is too bad Cupcake was not there when you lived in Columbia. I live in Charlotte,NC, but my brother goes to USC, so I am in Columbia often. Any amazing food finds you can recommend for future posts? Thanks and have a great day! This gets my vote. I can just imagine how the bacon melds with the sweet, strong bourbon plus maple syrup. It’s like a breakfast-dessert apertif. Genius! Thanks Carolyn, You described it perfectly! Well, it’s been a few years since I was in school in columbia, and at the time… I was a poor college student who would rather spend money on pitchers of beer than decent food. But, if I think of anything, I’ll let ya know. I had this drink last night, it is incredible! I’m a fan of bacon-infused anything. In Las Vegas they have a great Bacon martini I had at this dive, The Double Down. 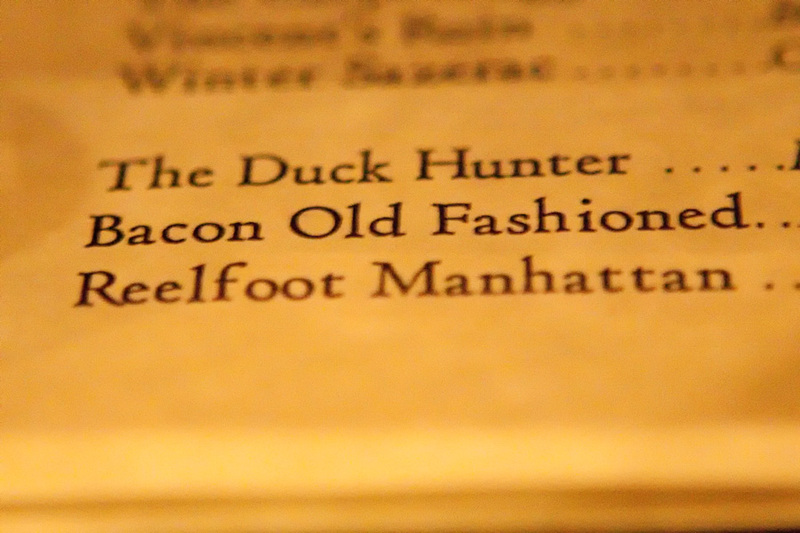 Ever since that delicious martini, if I see “Bacon-infused” I order it! Great photos here too btw, I was in search of explaining this drink and this was a perfect link to fwd. That drink is awesome! You are lucky that you got to have one last night. Next time I am in Nashville, I am definitely going to have to get another one! The drink in vegas sounds interesting, I am adding it to my list of things to try.